Why We Love Motor Trips! I just love motor trips! 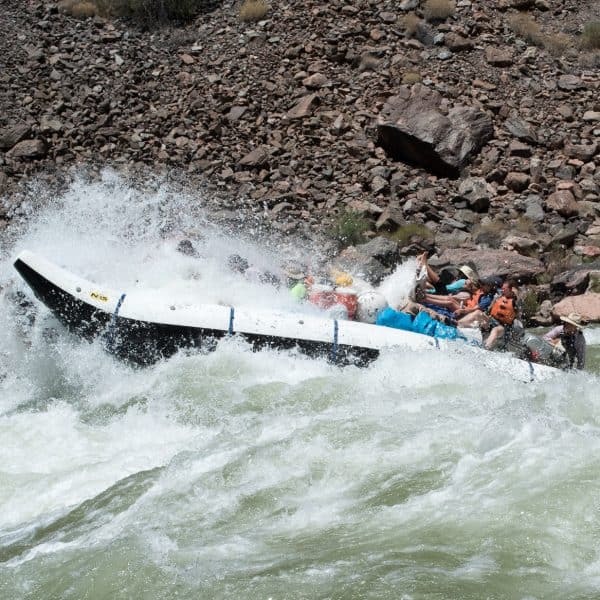 While I am still relatively new to the Grand Canyon rafting experience (my very first rafting trip anywhere was in 2011 and was in Grand Canyon), although I enjoy all of our adventures, I really do love motor adventures. I have now done all of our adventures, and I find that doing the motor gives me the option to see the full 226 river miles of the Canyon without having to miss as much of my managerial duties, and of course precious time with my family. 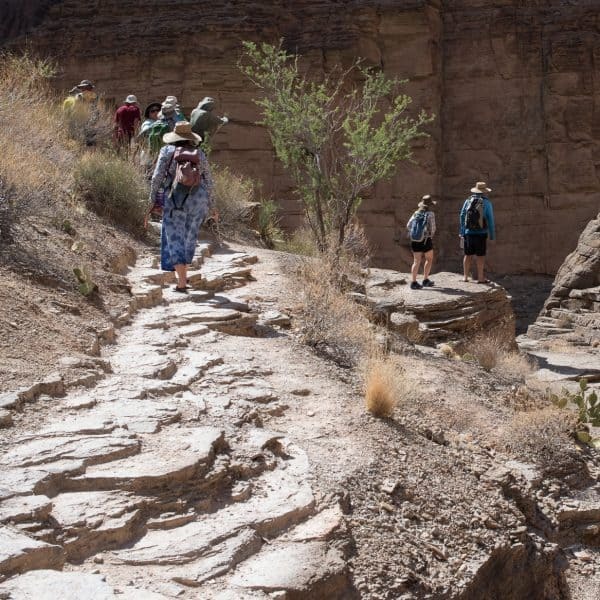 By doing the full canyon motor adventure, I have found I best absorb the geology, the human history, natural history, the camp sites, the hikes, the adventure in the shortest amount of time. Back when I was a brand-new river rafter, I was certainly anxious about the rapids, so when I saw the motor boats for the first time, I felt much more at ease because they’re such a secure-feeling, larger raft. Now that I’ve gone on all of our adventures (Classic, All-Paddle and Motor), I am comfortable on them all, but I find that I still really enjoy the secure-feel of the motor boats. 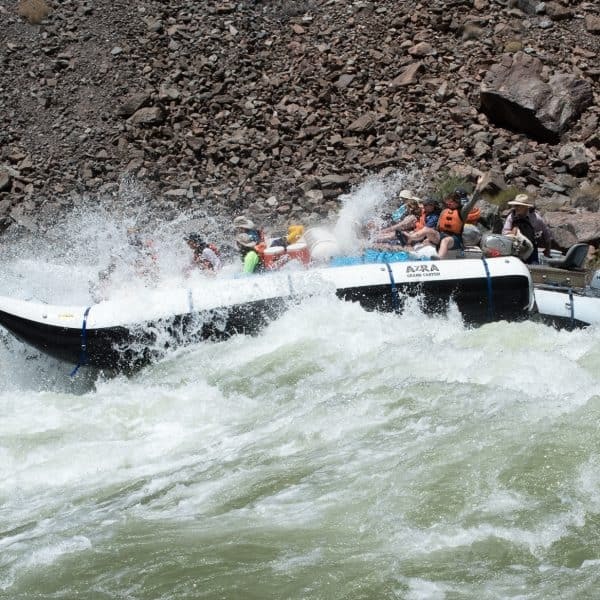 A lot of people assume the motor boats aren’t exciting—sure they may not be AS exciting as a paddle or oar boat, but they’re still a really fun, splashy, up close and personal ride in the rapids. There’s also another reason I love motor trips: there’s no hiking in or out required! It’s a round-trip experience in and out of Flagstaff. 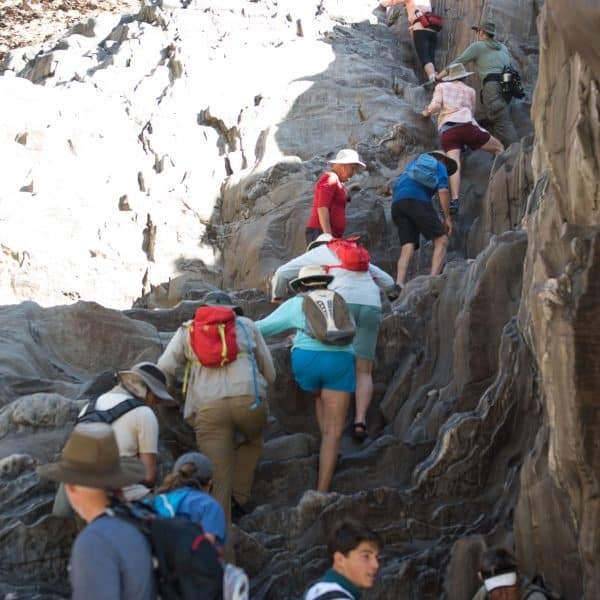 Although the hike on the Bright Angel Trail is absolutely beautiful, and an adventure in and of itself, it’s simply not an option for everyone. I’ve now hiked it 3 times, and I do enjoy it, but it sure takes a toll on my body. I love that on a motor trip, I can see all the sights, do all the hikes, enjoy all the rapids, eat all the yummy food, and yet NOT HAVE TO HIKE IN OR OUT. I don’t feel like I miss out on continuing to enjoy the people I’m spending time with or thinking about all the many beautiful places I’m missing like I do when I hike out. Even when I hike in, I think about all the amazing places on the upper portion that I missed out on because I’m only getting to see the lower. As a reservations manager, I love that our motor adventures allow for multi-generational families to experience the Canyon. We are much less likely to have both grandparents, children and grand kids all together on our Classic or All-Paddle Adventures. It’s really a treat when these families come back and rave about how amazing it was to be on the river with their families, completely unplugged from the real-world; no hand-held devices, no phones, no games, no iPads—just family. We have this on our Classic Adventures, too, but accommodating the three-generational families is much more doable on our motor adventures. But you can’t just take my word for it! Here are what some of our guides have to say about why they love motor trips! “The group dynamic – having one or two boats the guests all tend to share the same experiences, interpretation, humorous situations, etc. that happen on a day to day basis, and these common experiences lead to a pretty cohesive and fun group dynamic. “First off, the comfort level is awesome having a boat so big, that it might as well be a yacht!! Allowing for room to move about while on the water is great. I know I can’t sit still all day, so it’s nice to be able to shake out the rain gear after some of the bigger rapids and stretch the legs before the next hike. 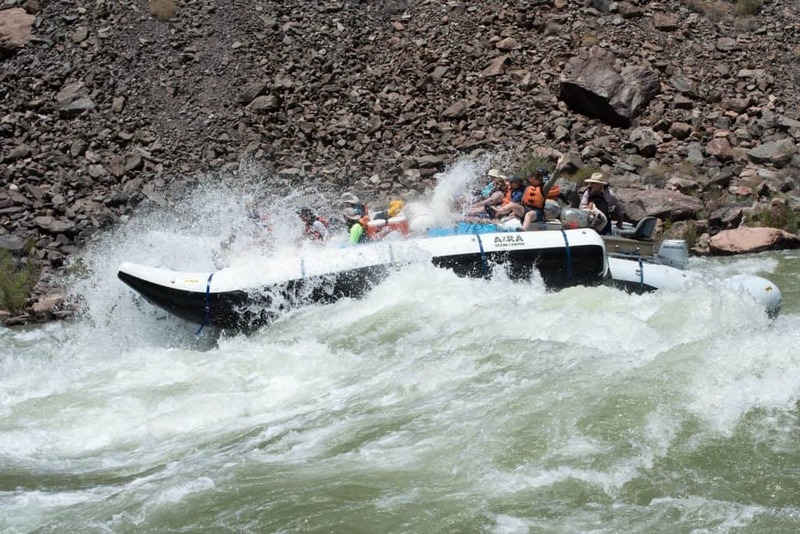 Another great use of the space is that you don’t have to be up front for every rapid, allowing one to dry out if the rapids prove to be too intense or just too chilly in those shady moist mornings. Did I mention the yacht has room for almost anything from hiking sticks and guitars, to fishing poles and big pelican cases? We can almost always find a hatch to store equipment that you choose to bring along. “I, personally, love motor trips because motor boats are really fun to drive. They also allow just about anyone to come on the river. I have had really mixed groups, like moms and dads in their late 60’s and 70’s who have no intention of hiking who came along with a large group of sons and friends in there 20’s and 30’s. The younger aspect of the trip had every intention of hiking, playing, swimming rapids and doing everything that involved adventure. In a case like this, although it is challenging, it is possible to give both ends of the spectrum what they want from the trip. On a one boat trip, you are a self-contained unit, and are with friends and family daily throughout the adventure. Travel the length of the river in a much shorter time. Experience the rapids from a very comfortable seat on the J or S rig. See the rapids from a very different perspective. 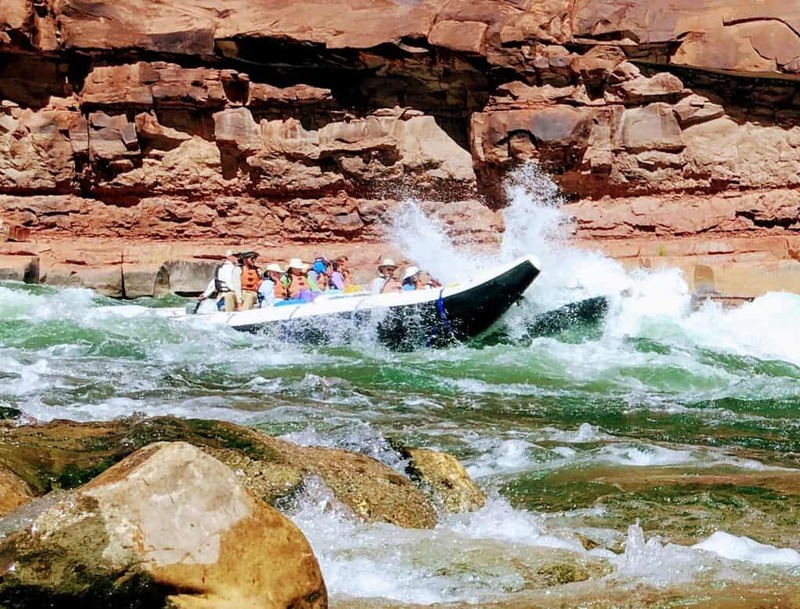 Come join us for the adventure of a lifetime, exploring beautiful Grand Canyon on the Colorado River! Our 2019 Motorized Adventures are filling up quickly. Contact us soon! We have ONE motor trip with availability left on it for 2018. August 9-16 is the date, and it’s currently on sale at 10% off! Reserve your spot(s) here! We loved the motor trip for two reasons. First, we were an intergenerational family, ages 10 to 75, and we could all go together. Second, we could do the entire canyon without an arduous hike that most of us were unprepared for. SO! Thanks, AZRA! for making it possible to share this wonderful experience together. We 100% agree with you, Melissa! Such great reasons to go on a motor adventure. We’re so happy your family was able to have such a wonderful experience with us! I have made 2 motor trips. I still have difficulty explaining to friends how these make canyon trips so much more accessible to the many of us who are able to handle the physical demands of the paddle trips. On the motorized trip you have many options on hikes, etc to tailor the trips to your own interests and abilities. I have been on trips to some other amazing places – but still, nothing compares to this trip down the river – so amazing it is hard to describe. Thank you for your thoughts, Richard! It is great how accessible motor trips make Grand Canyon. It’s an amazing experience we want many to have. Hopefully you’ll be back again soon!